Enhanced Vision welcomes the opportunity to understand your low vision needs. Macular Degeneration & other low vision conditions are hard to comprehend and understand. The different affects of these diseases can result in devastating changes to your vision. We at Enhanced Vision understand these questions and would like to discuss an electronic video magnification solution with you. Visit our page about the terminology and differences between digital and optical magnification. We have complied a page of useful low vision resources that includes links to regional and national low vision organizations. Most users begin with a hand held optical magnifier to help them to read and write. These typically work in the beginning stages but as the disease progresses, more light and magnification is needed. We can help! By purchasing one of our low vision electronic magnifiers you are able to get the proper lighting and magnification to suit your needs. Not to mention, the great features! 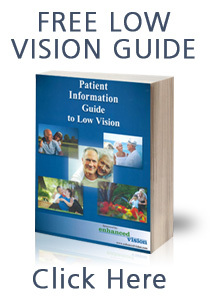 If you are not yet ready for an in home demonstration but would like to receive our free low vision guide and our product catalog, please click here.